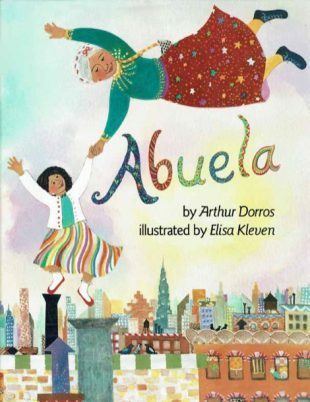 Somersaulting in midair, resting in the sky on a chair-shaped cloud… A little girl and her grandmother, her abuela, soar in this highly acclaimed adventure of the imagination as they fly around New York City. In English, with Spanish words and phrases woven into the story, includes a glossary. This story is based in great part on my warm and rich relationship with one of my grandmothers, who for many years lived in New York City. When I moved to New York as an adult for a time to learn more about writing, illustrating, and making books, one of my favorite places to visit was at the top of my apartment building. From there I could see the city from above, with sweeping views from the Statue of Liberty to midtown Manhattan. I had pictures and exact locations in mind as I wrote, for all of the places Rosalba and Abuela visit in the story. My grandmother, like the story’s Abuela, grew up primarily speaking a language other than English. She actually grew up speaking several languages, and then learned English when she moved to this country. When I lived in New York I heard many tongues each day, English and often Spanish. I like the sounds and rhythms of various languages, and I enjoy speaking Spanish as well. So I decided to include Spanish words as part of this story in a way that anyone reading it could understand, whether they knew Spanish or not. All of us have a variety of cultures, traditions, and backgrounds that are part of and take flight with each of us. Enjoy your own high-flying adventures and imagination!